Late last week, Final Draft released a new version of Final Draft Reader, adding support for iPhones to their heretofore iPad-only app. From a basic design standpoint, their iPhone implementation is almost identical to what we did with FDX Reader, using a continuous scroll rather than page-flipping to accommodate the smaller screen. I won’t break out the old imitation-is-flattery bromide; it’s simply the right choice given the situation. Unfortunately, you’re going to be scrolling a lot with Final Draft’s version, because they insist on using traditional Courier. It’s a mistake. You simply can’t fit very much on the screen using that font. Final Draft Reader isn’t trying to match printed pages like it does in portrait view on the iPad, so there’s simply no good argument for sticking with Courier for this “Reader View.” It’s just bad design. Being an official product, the app provides “100% accurate Final Draft pagination, formatting and page breaking.” That’s like saying only Coca-Cola can provide pure Coke flavor, but fine. Their app can do several things FDX Reader doesn’t even attempt, such as editing ScriptNotes and showing colored page revisions. You can link to your Dropbox account, but only for exporting files from the app, so it’s not particularly useful. That’s consistent with a lot of what I found: placeholders and possibilities rather than actual utility. Final Draft Reader is now free. That makes sense; they want users to pay for the $50 Final Draft Writer app. We’ll keep selling and supporting FDX Reader as an alternative, but as I wrote back in February, we’re not actively developing it anymore. Our next projects include more ambitious efforts like Highland. 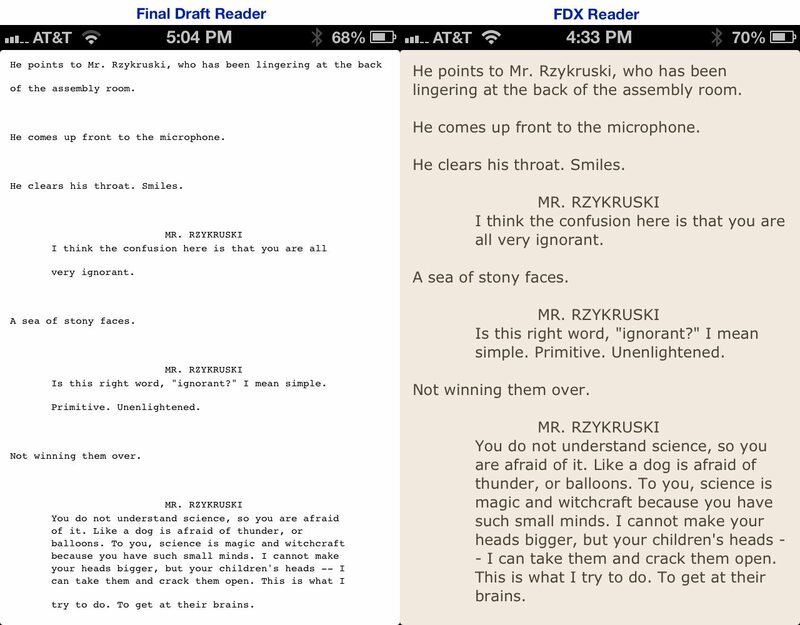 FDX Reader, our app for reading Final Draft scripts on the iPad and iPhone, came out a year ago today. Usually, when people say, “I can’t believe it’s been a year!” they mean something like look how time flies or it seems like only yesterday. But when I say I can’t believe it’s been a year, I mean that I can’t believe it’s been only a year. FDX Reader feels like something we did a very, very long time ago. Why is my internal calendar so wrong in this case? 1. Digital things move faster. Draw Something is a hit! Zynga buys Draw Something for $180 million! The rise and fall of MySpace took years. The cycle for Draw Something has run about eight weeks. Even though the time span has been incredibly compressed, our brains still try to ascribe a certain amount of time for a rise-and-fall cycle, so we subconsciously back-date events. It’s not just apps that move faster. Many memes are essentially digital, and experience the same time-shift phenomenon. Quick: When did KONY2012 happen? Was it before or after the Mel Gibson/Joe Ezsterhas fracas? And what about the Sandra Fluke/Rush Limbaugh controversy? 2. My clock started when we began working on the app. I think there’s an opening for an FDX Reader (called, perhaps, FDX Reader) that would simply register itself to iOS as able to open .fdx extension files. Then, when someone taps a file with that extension in Dropbox or Mail (or whatever) it can launch. That way, you don’t really have to worry about getting files to into it. What matters is the reading experience. Make it look nice, like the Instapaper app. Perhaps give the ability to add notes, but don’t try to become a screenwriting app. If that’s interesting to you, happy to go halfsies with you. Lemme know. That process took a little over six months, so it’s reasonable that the app feels older to me. 3. So much has come after it. All that activity seems like too much to have occurred in just a year, so I’m mentally stretching the time period. 4. The less attention you pay to something, the further back in time you push it. We don’t really do much with FDX Reader now. Our last update simply upgraded the graphics for the new iPad. If as rumored the new iPhone has a larger screen, we’ll make whatever changes we need to make. But the app itself is basically done. We built the app because Final Draft hadn’t come out with its own reader. Now they have. Ours still sells remarkably well — probably because we’re the only one that works on the iPhone. You never forget your first time, and FDX Reader really has been a remarkable experience bringing an idea to life. In celebrating FDX Reader’s first birthday, I’ll invite you to try it out if you haven’t. FDX Reader, our app for reading Final Draft files on the iPad, is now a universal app with support for the iPhone and iPod Touch. It’s available on the App Store today. It’s a free upgrade. We developed the iPad version of FDX Reader first because the larger screen is such a natural fit for reading screenplays. We took inspiration from readers like iBooks and Kindle, flipping virtual pages. It’s been great to see it get such a positive response, both among screenwriters and the tech press. But in some ways, I think the iPhone version serves a more crucial need. 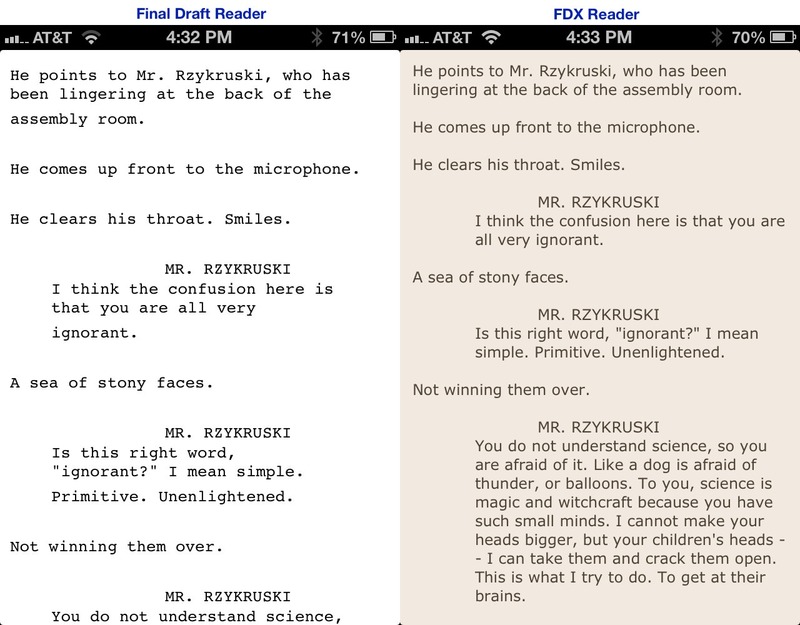 Up until now, reading screenplays on the iPhone has been terrible, even with PDFs. The small screen simply isn’t friendly to 8.5 x 11 sheets of 12-pt Courier. You end up pinching and zooming and straining your eyes to see anything. While it was technically possible to read a full script on the iPhone, you’d never want to. Our design choices were driven by the smaller screen. The iPhone is nothing like a printed script, so we felt free to break from screenplay conventions. We sliced margins. We stopped flipping pages. We picked a font that worked great at smaller sizes. The iPhone version of FDX Reader takes its inspiration from non-book apps like Instapaper and Reeder. We focused on the text, not the area around it. We kept two of the best features of the iPad version. The page popover lets you skip right to a given page, scrolling the text as you go. The type button gives you five choices of size — since people hold iPhones closer, you may find yourself going much smaller than you think. And to maximize screen real estate, we dismiss the header with a center tap. FDX Reader was made by the same team of Nima Yousefi, Ryan Nelson and me. Many thanks to all our beta testers for their suggestions and bug reports. As with the initial FDX Reader launch, I’m sure we’ll find some unexpected situations as we expand support to additional devices.1 If something’s not working, tell us. We’ve been able to iterate so quickly — five releases in seven weeks — because our users help us. If you’re new to FDX Reader, check out the demos and videos on the site. If you’re already a user, the new version should show up in your Updates immediately.